This month we had the pleasure of interviewing one of our talented cosmetology instructors, Kristine Marcum. She’s a wizard with hair color and has a tangible passion for the beauty industry. She’s an integral part of the AIB family, and makes a noticeable impact on the lives of our students. We hope you enjoy hearing her story and getting to know her as much as we did! Kristine was first introduced to the idea of attending cosmetology school when she was in high school. She had the opportunity to tour a local cosmetology school, and it excited her about a career in the world of beauty. Kristine had always been playing with hair and makeup, and wanted to turn her favorite past time into a career. Before completing a cosmetology program, she attended two different modeling schools because she was still trying to find her area of interest. During that time, instructors always remarked about how excellent her hair and makeup work was. Once she got started in cosmetology, Kristine was one of the quickest students to begin excelling! In her professional career, Kristine has continued to learn at every opportunity and sharpen her skills. Her industry experience is wide and extensive, covering all sorts of cosmetology fields, from hair color to makeup. She has moved around the country many times, experiencing new and exciting things along the way. She was an educator for L’oreal when it only did color, and has since become an expert in all things hair color! Kristine has been educating at AIB for two years as the cosmetology phase two instructor on the salon floor. She is passionate about grooming new people to come into this industry. She always says she wants to teach students so well that she would want to hire them. Kristine has been doing hair for 30 year, so she shares her passion and dedication every day with her students. She loves that you can always learn something new in the beauty industry, and our hope is that our students can pick up that attitude from her. Kristine has also been trained and certified in eyelash extensions through Bella Lash, and now teaches this elective to students who would like to become certified themselves in this area of the beauty industry. When asked what she loves most about AIB, the first thing Kristine mentioned is the people that she works with. She loves that the AIB staff works together to make decisions and set goals by collaborating on how to make the school better. She also enjoys the level of individual freedom she is given as an instructor. She feels like there is a good balance between personal and group decision making. Coming together and making changes is what AIB is striving for, and Kristine loves being a part of it. She also enjoys the diversity of people at the school, from their origins to the way they perform beauty services. Whether you are a high school graduate or someone looking for a career change, American Institute of Beauty is where you can make your future happen. 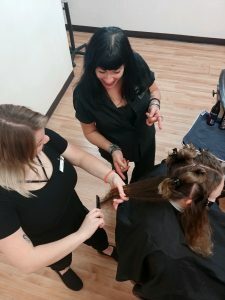 We offer a large variety of programs to meet the needs of as many students as possible, including cosmetology, esthetics, barbering, nail technology, makeup, and more. Contact us at our Largo or St. Petersburg campus to learn more about how you can get started today!